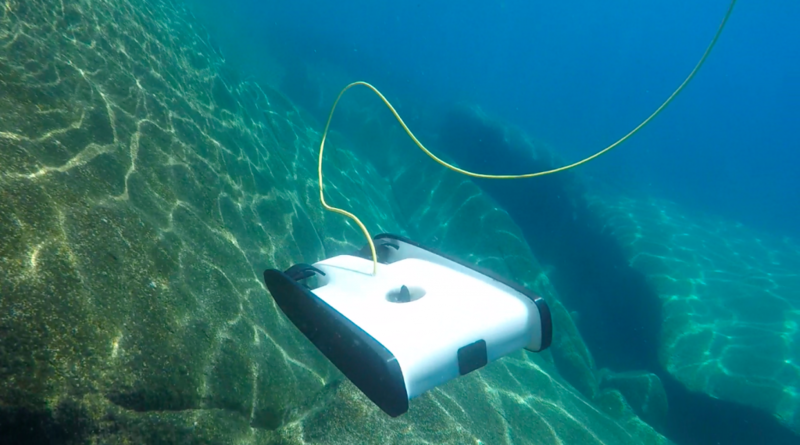 OpenROV releases Trident, a new affordable underwater drone. The first OpenROV Kickstarter project was a big success – making almost $100,000 more than their $20,000 goal. Since then they have grown significantly, shipping over 1,700 OpenROVs to more than 32 countries around the world. The Trident underwater drone weighs less than 3kg, and is small enough to fit in a backpack or underneath an airplane seat. It can dive to 100m depth. It’s hydrodynamic shape allows it to move both quickly and precisely. Trident sends live video back to the surface by way of a thin, neutrally buoyant tether, and is controlled by a laptop, smartphone or tablet at the surface. Potential applications for Trident are numerous, including: marine biology projects, dive site surveys, boat inspections, and underwater exploration. Trident’s unique shape and design make it ideal for projects such as 3D mapping that require it to move along transects – long straight lines for surveying large areas. The HD video stream allows the pilot to view the underwater world in a way that has never before been possible, and Trident’s ease of operation makes flying the robot fun and exciting for anyone – regardless of technical skill. The OpenROV team has spent the past three years designing, testing, and developing Trident with the end user in mind. Expected delivery is November 2016. Trident is a giant step in that direction. Dieser Eintrag wurde veröffentlicht in Development, General, Hardware und verschlagwortet mit openROV, Trident, underwater robot von Sebastian Trella. Permanenter Link zum Eintrag.